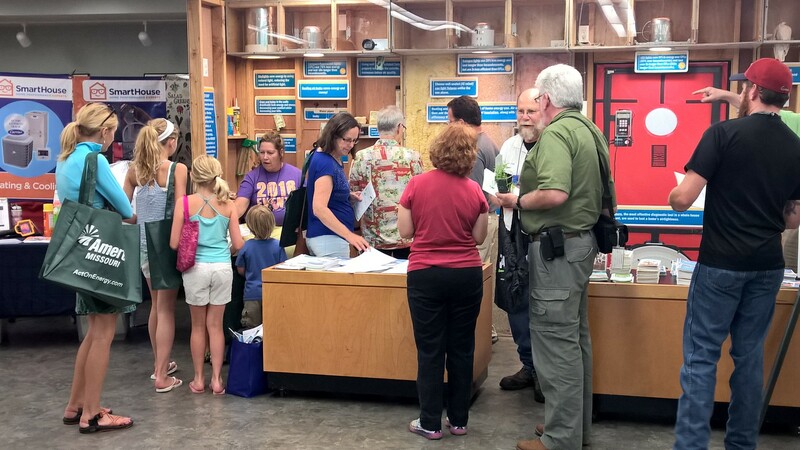 Science and EarthWays Center Open House - Science and Sustainability in Action! Go behind the science with Missouri Botanical Garden botanists at the Monsanto Center and meet the Garden’s sustainability experts on their home turf in the Commerce Bank Center for Science Education by attending our upcoming "Science and Sustainability" Open House Weekend on February 25-26. Did you know that the Garden is one of the most active and productive botanical research institutions in the world? Researchers from our Science and Conservation Division are dedicated to studying plants and their ecosystems both globally and locally. The knowledge that Garden scientists gain and the sharing of their discoveries inform conservation decisions. Conserving biodiversity is a key objective of the Missouri Botanical Garden and is an essential component of Garden programs. Garden sustainability experts zero in on what scientists agree is the greatest threat to conserving the world’s plants: people. EarthWays Center, the Garden’s sustainability division, is devoted to the goal of "sustainability" – conserving energy and natural resources for the future and meeting the needs of the current generation without compromising the needs of future generations. Our EarthWays team helps the Garden educate and connect people to what they can do to protect and restore air, water, and soil so that plants and people can thrive. Monsanto Center, 4500 Shaw Blvd. Want to know how new plant species are named and described? Or examine the cellular structure of a moss with a microscope? At the Monsanto Center, you can meet Garden scientists from the Science and Conservation Division and discover how and why they study plants. Garden researchers work in more than 30 countries! You will see 20+ displays featuring exploration, collecting, and research results. You will learn how the Garden works to conserve plants both locally and around the world. You can also tour one of the largest herbarium collections in the world. Ever wondered how you would store more than 6.7 million pressed and dried plants? The Peter H. Raven Library will be open, too! You will be able to view rare, classical, and illustrated botanical text, some over 400 years old and still used today. Commerce Bank Center for Science Education, 4651 Shaw Blvd. At the EarthWays Center, you will meet the team that spearheads the Garden’s sustainability efforts and provides over 20+ programs to the community. Including helping with community initiatives like BiodiverseCity St. Louis. Learn "What is sustainability?" and how the Garden puts it into practice every day. See how the Garden makes everything from a small business meeting to the Best of Missouri Market "waste free" and adapt the guidelines for your own events. If you can think of a "green" idea for your school, the education team can help you achieve it. Want to add energy efficiency to your science program? Interested in cutting down on waste at your school? We’ve got answers for you! Investigate our programs ranging from sustainability classes and tours to presentations and teacher trainings. And that’s just the start! Visit our ENERGY STAR award-winning building at 4651 Shaw Blvd. and learn about the Green Business Challenge, U.S. Green Building Council- Missouri Gateway Chapter and how your home, building, company or community can implement sustainability programs large and small. Green building professionals, auditors, contractors, businesses and local municipality leaders are welcome to get answers to the questions, "how to I become a green builder, get certified as an energy auditor, learn about alternative energy sources?" Want to make your home more energy efficient and comfortable? Visit our Home Performance with ENERGY STAR exhibit and learn about our many resources for home owners. Don't miss this great opportunity to see how far reaching the Garden’s programs are and how passionately both groups work to achieve the Garden’s mission, "to discover and share knowledge about plants and their environment in order to preserve and enrich life". Sign up to receive our quarterly EarthWays Center e-newsletter. Join the conversation! Follow the EarthWays Center on Facebook, Twitter and Instagram to stay up to date on sustainability in the St. Louis region. Do you want help making your home, school or workplace more energy-efficient and sustainable? Would you like to take a tour or learn about classes and workshops? Are you looking for a speaker or eco-friendly activity for your group?